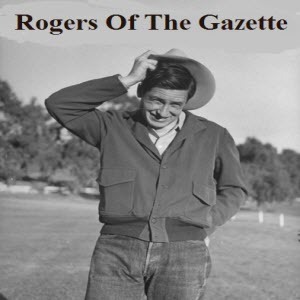 Rogers of the Gazette aired on Wednesdays at 9:30 p.m. on CBS Radio starring Will Rogers Jr.(October 20, 1911–July 9, 1993), son of legendary humorist Will Rogers (1879–1935). Homespun, slow-spoken Will is the friendly editor of a country newspaper who struggles against the pressures and prejudices of small-town life. He drops gems of wisdom in his razzing voice, perhaps in a questioning manner, of his humorist father.